Continuing my series of faux magazine articles expanding the Baklunish pantheon and related matters, I happily bring you a pair of articles from the Fireseek 580 edition of Dragonne magazine, expanding both the roster of Baklunish deities, as well as adding a number of new monsters, including the buraq, a trio of elemental weirds, and a new race of geniekind, the houri. This simple list of gods has taken on a life of its own, and in future installments you can expect to see even more gods and goddesses as well as a full-blown expansion of the Gold Box gazetteer, complete with an expansion map depicting the rest of the Baklunish Basin beyond the Flanaess. Plus doubtless more stuff as well, as inspiration takes hold. For now, though, please enjoy the third in my Baklunish series, and do consider contributing to my Patreon. You’ll get sneak previews of new material, behind-the-scenes discussion of the creative process, and you’ll be helping support my efforts to put out more free stuff for our favorite setting. Download the latest file here. From the description, I’d have guessed Man’ur to be CG and not CN, but alignment is one of those things that people interpret in different ways. It’s cool to see Mouqol get an AD&D write-up. Good article! Excellent overall, Mr. Bloch-but that’s par for the course for you. I agree with Ewan Cummins, though, that Man’ur would probably be Chaotic Good rather than Chaotic Neutral. The Baklunish pantheon is already top-heavy with neutral gods as it is, so I’d be more inclined to consider Man’ur CG. I also appreciate your effort to incorporate more medieval Middle Eastern cultural traits into the Baklunish. 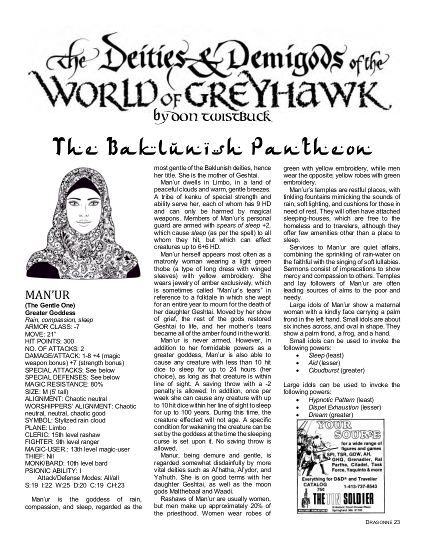 This ties into one of what I consider Greyhawk’s greatest strengths, namely its parallels with real-world cultures…even if it is somewhat incogruous to present Greyhawk Middle East (the Baklunish West) being right next to Greyhawk North America (the Flanaess). Excellent work. Love the content and the design! Will be printing this out and adding it to my binder of gaming reference material.